I’ve been thinking a lot about grounding recently. ‘Being grounded’ is an interesting phrase. In the spiritual world it is usually considered as a good thing. Many people are told they need to keep grounding their energies when they begin psychic work, to ensure they don’t burn out by using up their physical reserves. 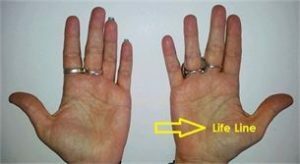 I have seen the hands of psychic mediums and energy healers where the Life Line (the line encircling your thumb) is faint and/ or it doesn’t reach the bottom of the hand. Usually the Head Line is strong (if they are a writer or a channel) or the Heart Line is pretty intense-looking (if they are a healer). Please, don’t be scared if you have a short or broken life line – it shows the life in your years, not the years in your life. Lines can change over time, especially as you improve your lifestyle and attitude. People with square hands or hands with broad bases to them are naturally more grounded and practical, whereas people with rounded hands or hands with narrow bases to them can appear more intellectual and airy-fairy. Good exercises to do if you are feeling spaced out are: Anything that heals your Root (1st) Chakra, e.g. running barefoot on the beach, yoga, hugging a tree (I’m serious! ), visualising that you have roots going down through the Earth to the other side, gardening, breathing into your feet, wiggling your toes, wearing red socks, foot massages and baths, rolling around on the grass, eating more good quality protein, nurturing your Kidneys and Adrenals, and eating activated nuts or root vegetables like sweet potato and beetroot. That last one can be important because if you are living on carbs the mood swings and hunger pangs will prevent you from feeling calm inside. It’s hard to be present in the moment when you’re starving! Of course, you can also go to the other extreme, where you become so ‘grounded’ by your thinking you practically bury yourself with expectations e.g. I can’t have a relationship until I lose xxkg or I better not start doing readings until everything I say is always true. If you live like this, it’s like being a student who never goes out (i.e. is grounded) because they want to pass all their exams – the only thing is that in life the exams never stop so all that happens is you become disenchanted with life and feel like giving up on your passions. In these cases it might help to compare yourself to a plane – until you take off, you won’t know how high you can go. If you’re scared of crashing then just make sure you watch your nose, literally. Nose up = taking off, nose down = heading for the ground. Changing your posture really does change your attitude. Just try lifting your head up next time you feel like crying. Of course, it’s all about balance. I used to get annoyed at how easily I lost track of time, or went off into dreamland until a spiritual teacher pointed out to me that not everyone needs to be equally grounded. Psychics in particular start off less grounded because their job is to access information that is ‘higher up’. So, using a nature analogy, some people are like trees which have deep root systems because they are meant to grow tall and protect or stabilise the environment around them. Other people like psychics or healers are more like soft plants, e.g vines or grasses which have shallow roots. Sure, they may need more physical support from others to thrive but their flexibility also allows them to recover quickly from setbacks. Next time someone tells you that you need to be more grounded, take a moment to feel into your body. If you are feeling fine then maybe this person is simply reminding you that we all have our own special balance of structure and flow to find. Comparing ourselves with others may be natural but it’s also about as logical as a tree comparing itself with a parrot! You are here on Earth now because you need to be here, whether you feel grounded or not. So please, smile and turn on your inner light today so the rest of us can find you. In the right hands, one candle can light a thousand more.